Rosie, shop assistant for the Waiuku Junktion. Photo courtesy of Waiuku Zero Waste. Have you checked out the Waiuku Junktion yet? This shop located out at the Waiuku Community Recycling Centre is helping to reduce landfill waste by upcycling goods that community members no longer need. Operated by Waiuku Zero Waste, the facility provides recycling, rubbish, and green waste services. The centre has one mission: to turn Waiuku’s waste in resources to eventually achieve zero-waste. 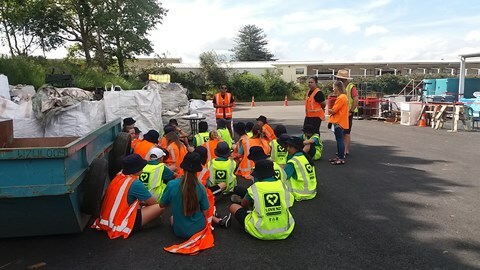 Community members can bring their unwanted material to the Waiuku Community Recycling Centre to have it properly sorted. The centre diverts approximately 75 per cent of the waste it receives from landfills. A school group learning about circular economy and clean recycling. Photo courtesy of Waiuku Zero Waste. The centre is currently constructing a new building. The new space will house repair workshops and demonstrations on responsible recycling, as well as education in sustainability, circular economy, composting and upcycling. “With help from Auckland Council supplying us with a new building, we are really looking forward to increasing our services from only taking waste and recycling, to also taking large groups from our community and educating them on how to achieve zero waste,” says Sam Edgecombe, Assistant Manager at Waiuku Zero Waste. Edgecombe says that the Board of Trustees for Waiuku Zero Waste are also looking into starting a tool library that would allow locals to hire all sorts of tools to help restore and build items at home using recyclable materials. Waiuku Zero Waste is contracted by Auckland Council to operate the Waiuku Community Recycling Centre.